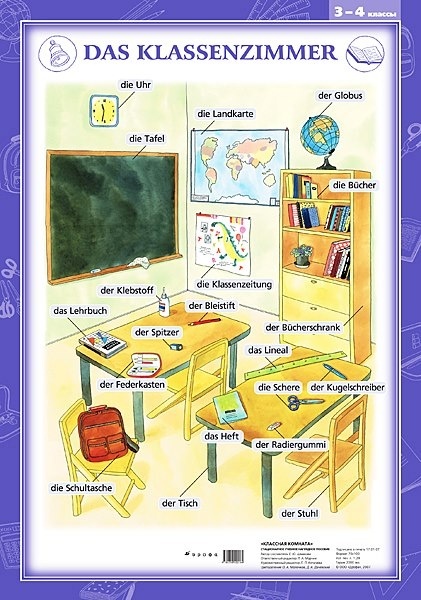 Take German out of das Klassenzimmer! Come to our High School Event! We offer this special event to German students to learn about Bavarian culture on Tuesday, March 18, 2014, from 6:30-9:30 PM. Don’t wait, reservations are due by March 3! The Alpen Schuhplattlers are delighted to be attending the 24. 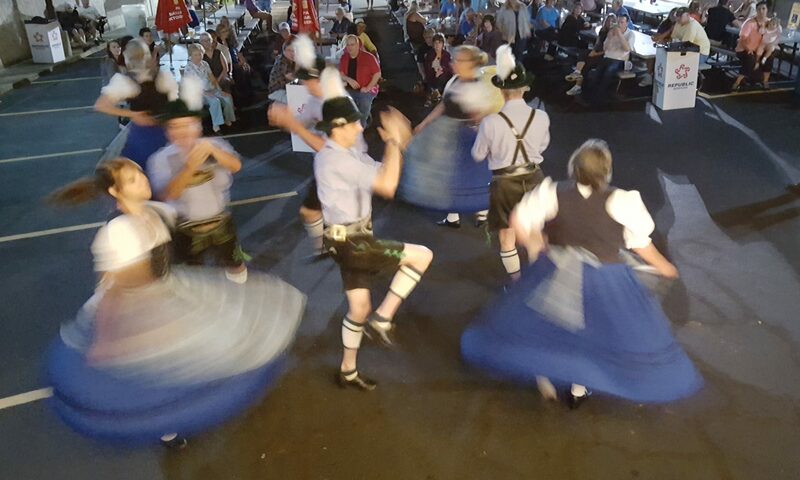 Gaufest des Gauverband Nordamerika in Sandusky, OH hosted by our Patenverein, S.T.V. Bavaria Cleveland, OH. Tickets are now on sale for our 49. Stiftungsfest on April 20, 2013. Tuesday, March 19, 2013, from 6:30-9:30PM. Hurry, reservations are due by March 1! Our 1. Vorplattler und 1. Vortänzerin, Alex and Renee, surprise concert goers with a Schuhplattler at the Teutonia Männerchor's choral performance in Altburg, Germany. 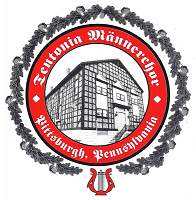 On July 29, 2012, Patrice Romzick, president of Springerle Joy, LLC, conducted a Springerle cookie making class for the Alpen Schuhplattler und Trachten Verein D’Pittsburgher. 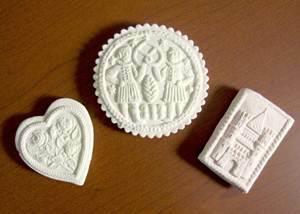 Springerle cookies have an embossed image made by pressing a mold onto rolled dough and allowing the dough to dry before baking to preserve the detail of the raised surface pattern. The word "springerle" refers to how the cookies rise up when they’re baked, as from the German verb springen. Sometimes they are referred to as “pillow” cookies because they are so puffy. The origin of Springerle cookies can be traced back to at least the 14th century in southeastern Germany and surrounding areas. Scenes from the Bible were some of the earliest images depicted on the springerle molds. They were used to teach those who could not read or write. As time went on, scenes from everyday life, as well as from holidays and special occasions appeared on the molds. Springerle cookies are about as easy to make as a cut-out sugar cookie. The recipe we used had only four ingredients: flour, powdered sugar, eggs and flavoring oil. We flavored our cookies with the traditional anise (licorice) flavor, as well as lemon and raspberry flavors. After preparing the dough and rolling it out between wooden guides to ensure uniform thickness, we created various images by pressing the Springerle molds onto the dough. Then we cut out the cookies using a pastry cutter and placed them on a cookie sheet. After a drying period of 8-12 hours, the cookies were baked. When thoroughly cooled, some of the cookies were dipped in white chocolate. Finally, the cookies were packaged in clear plastic gift bags with a ribbon tied around the top. 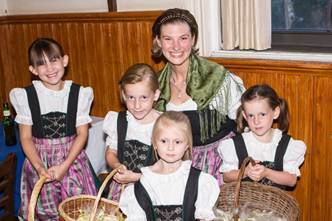 We sold the Springerle cookies at our annual Alpen Bavarian Fest, on August 18, 2012. They were a big hit! 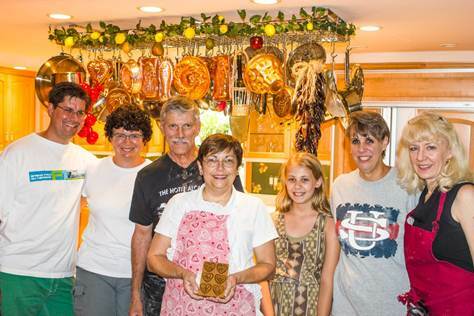 Our instructor, Patrice Romzick, has been an avid Springerle cookie mold collector and professional Springerle baker for the last 6 years. In fall 2009, Patrice attended a Springerle cookie mold fair at the Württemberg State Museum in Stuttgart. There she met the owner of Änis Paradies, Mr. Linus Feller. Änis Paradies of Switzerland has the largest collection of Springerle cookie molds in the world. Mr. Feller invited Patrice to sell Springerle cookie molds for his company in North America and she accepted his offer. On the Springerle Joy™ website (www.springerlejoy.com) you will find more than 900 traditional cookie molds for baking and crafts, as well as recipes, tools, flavoring and how-to videos. 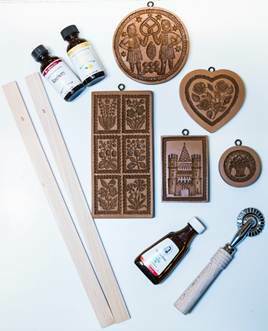 The Springerle cookie molds, many which are replicas of antique molds from the last 400 years, are all crafted by Änis-Paradies™ of Switzerland. 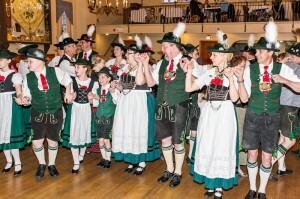 Tickets for our annual Alpen Bavarian Fest on August 18, 2012 are now on sale.